Iranian artist and activist Atena Farghadani, who was charged with “insulting members of parliament through paintings” for a caricature she drew lampooning debate on a bill that would outlaw some forms of contraception, has reportedly been sentenced to 12 years and nine months in prison. 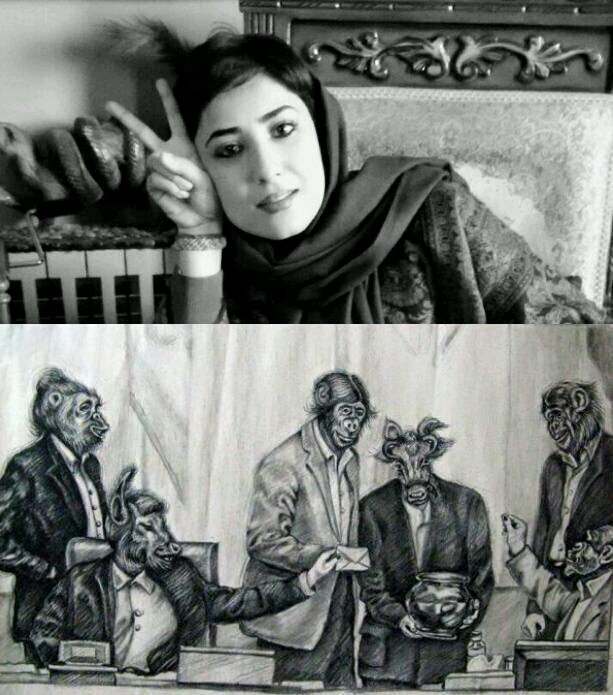 What Atena drew was just an innocent take on what the parliamentarians are doing, and based on the Iranian culture, monkeys are considered the followers and imitators, [and] cows are the stupid ones…. Many members of the Iranian parliament are just following the leaders without any thoughts. The bill that drew Farghadani’s derision seeks to ban voluntary sterilization procedures such as vasectomies and tubal ligations in an effort to reverse Iran’s falling birthrate. She was initially jailed and released while awaiting trial last year, but rearrested when she posted a video on YouTube describing beatings, strip searches, and threats from guards. Upon returning to prison in January she went on hunger strike to protest poor conditions, suffering a heart attack after three weeks. She is now being held in a different detention center and no longer on hunger strike, but Kowsar said that during her trial “she was beaten up by the security agents…near the courtroom, in front of her parents” for talking about her earlier mistreatment in prison. If after 2009 I was present by the graves of 2009′s martyrs or I joined their funeral [it] was because…their murderers were never found and government also insulted and treated them with a disrespectful attitude, I just tried to heal their families, because I felt we’re all members of one family. If I did anything against execution [it] is because I think that execution is an inhumane and false punishment, doesn’t matter if it’s a drug trafficker’s execution or a political activist. I imagined my family in their families’ position and I felt we’re all one family! If I objected that…our Baha’i compatriots don’t have the right to study [it] was because I imagined myself in their position and I felt they’re a member of my family and each person with any nations, beliefs, and thoughts should have the same and equal rights and equality should run in society. If I drew that cartoon of assembly representatives [it] was because I believe that if someone choose arts as their subject but do not criticize the issues of their society, [they] have betrayed themselves, their [conscience], and their society. Despite the crushing verdict and sentence, Cavna reports that an appeal is apparently in the works. As Kowsar points out, though, Iran’s jury-less judicial system has already worked against Farghadani, as her trial was overseen by a judge who is notoriously tough on political prisoners. It is unclear if the next phase will be any different, but all that international observers can do is keep Farghadani’s case in the public eye and continue to put pressure on the government of President Hassan Rouhani, who claims to represent a departure from Iran’s brutal past.